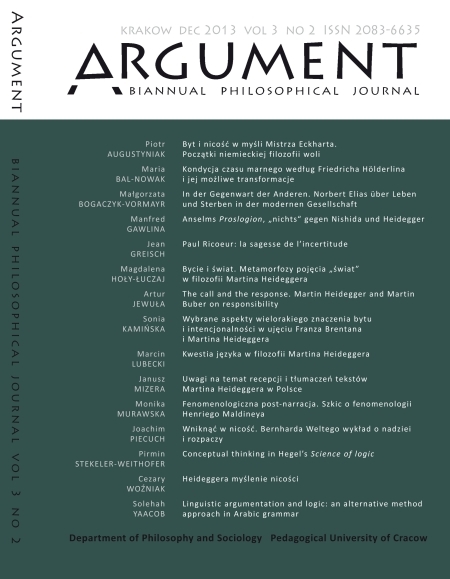 (1) Articles and Treatises; (2) Review Articles and Polemics; (3) Debates and Interviews; (3) Translations into Polish; (4) Teaching Philosophy, Philosophy of Teaching, and Lecturing; (5) PhilosOFFer’s Lens; (6) Obituaries and Memories; (7) Book Review Notes, Reports, Announcements and Invitations. Ames and scope. 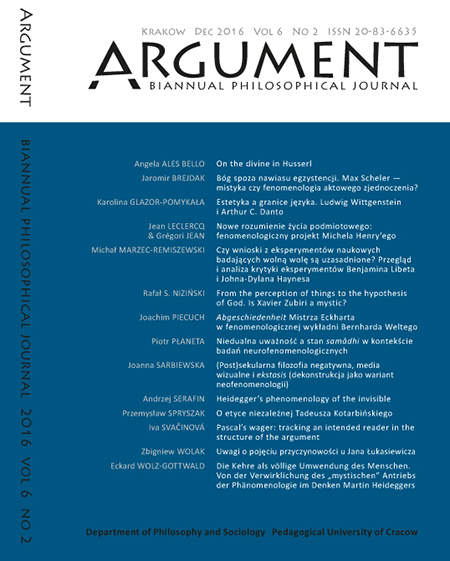 The Editors of the journal invite scholarly studies in history of philosophy and papers reporting the on-going debates in contemporary philosophy, representing various currents in philosophical inquiry, including continental, analytic and non-western traditions and comparative perspectives. 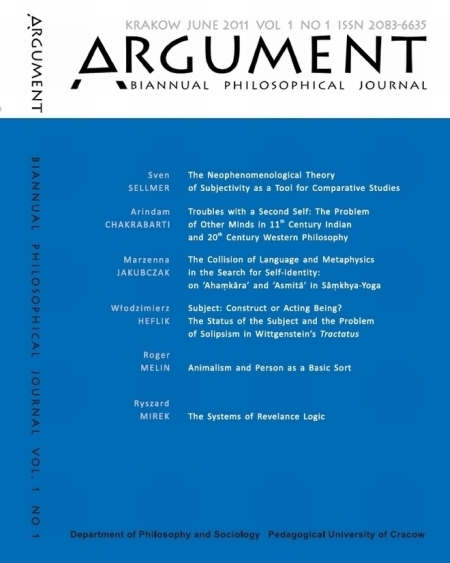 Moreover, in the scope of our interest there are interdisciplinary papers undertaking philosophical problems in terms of other scientific disciplines. 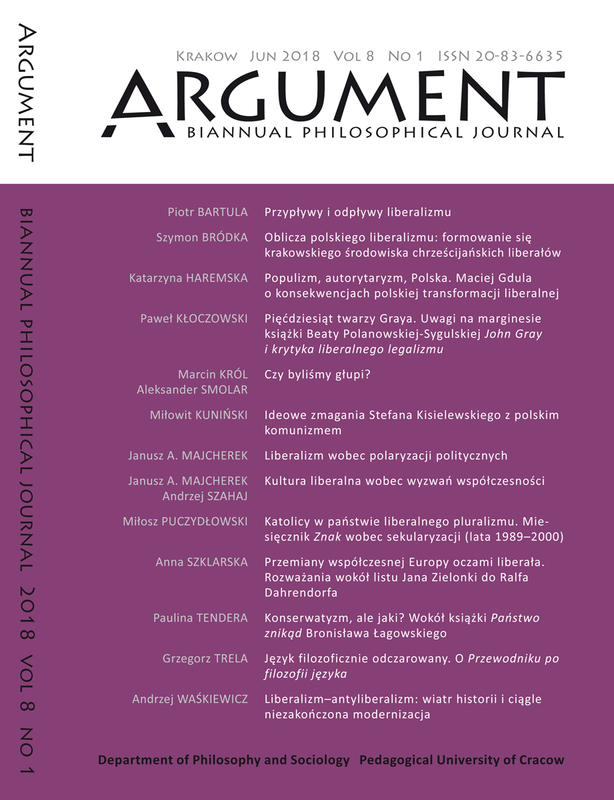 We also publish polemical papers, responses and interviews, book reviews from professional philosophers and postgraduate students. Besides, we are open to critical and innovative suggestions concerning teaching methods and the purposes of up-to-date philosophical education. Indexing. The Editors provide immediate open access to the content of the Journal on the principle that making research freely available to the public supports a greater global exchange of knowledge. 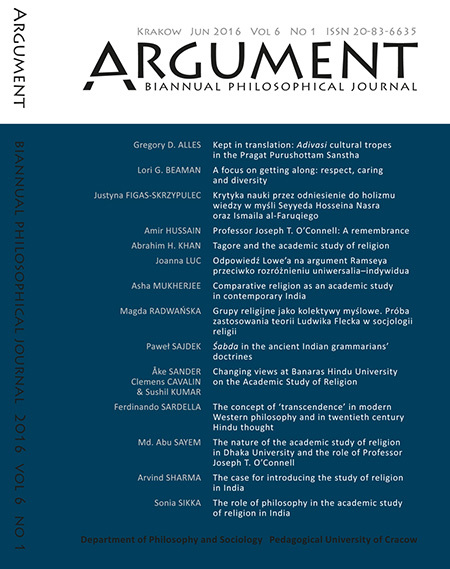 The online form is considered as the reference version of the journal. We are searchable in the following indexing databases, repositories and global catalogues (the list is being successively extended): CEEOL, CEJSH, DOAJ, ERIH PLUS, The Philosopher’s Index (coverage list by EBSCO), PhilPapers, etc. Publishing ethics. The Editors strive to meet the high standards defined in the Code of Conduct and Best Practice Guidelines for Journal Editors promoted by the Committee on Publication Ethics (COPE) . Copyright policy & self-archiving policy. The rights are reserved under Polish and International Copyright Regulations. 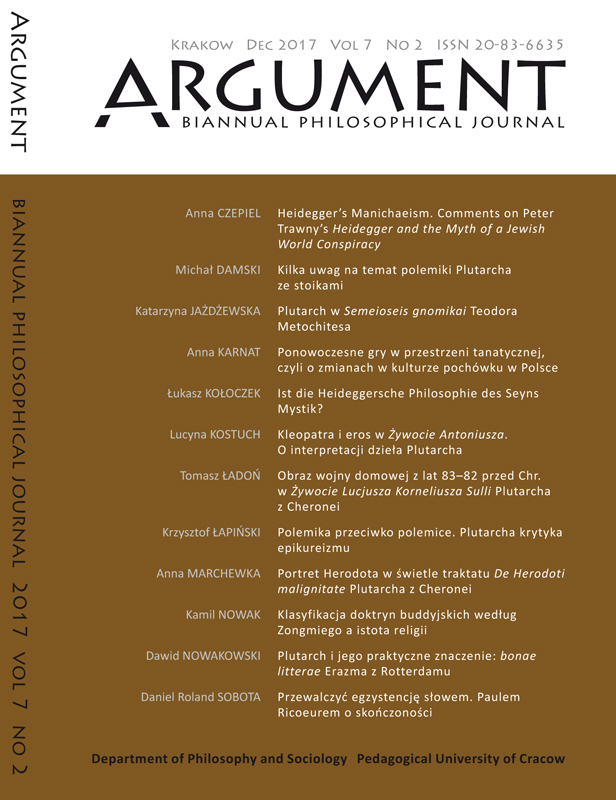 The Editors of the journal prefer to publish the original and unpublished materials, both in the Internet and hard copy format. Pre-print status: the authors can archive their pre-print papers on their personal web sites, however, the published source must be acknowledged. Post-print status: the authors can archive their post-print articles acknowledging the publisher copyright and source, and linking to the published version or providing the exact bibliographic information. The published contents is accessible on a non-profit server, and the publisher’s version (PDF) may be used. 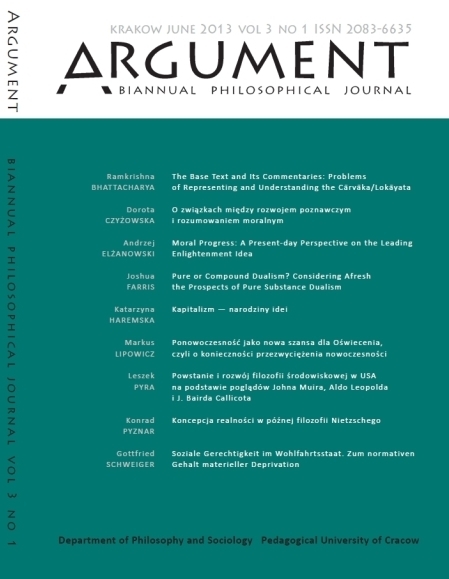 Fair use allows limited use of copyrighted material published by the Argument: BPJ without acquiring permission from the rights holders only in private non-commercial use including commentary, criticism, research, teaching, library archiving or other educational purposes, either as prints or by downloading, with full respect to the current legal Copyright Regulations and accurate acknowledgement of the source of citation or paraphrasing. 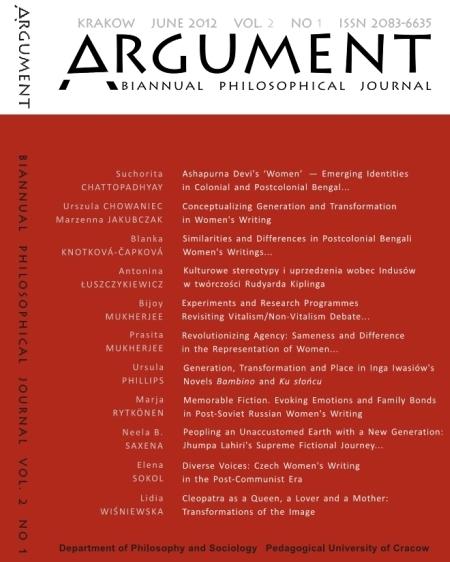 This journal is licensed under a Creative Commons (CC-BY-NC-SA 4.0 International). Attribution — You must attribute the work in appropriate manner (but not in any way that suggests that the licensor endorses you or your use of the work), specifying the author’s name, the title of the work, the journal name, and indicate if any changes were made. 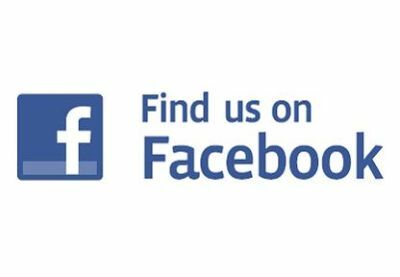 You must also provide a copyright and license notice, the journal URL or direct link to the article. Non-commercial — You may not use this work for commercial purposes without the permission of the author and the editors. Share Alike — You may build upon the work, but you must distribute your contributions under the same license as the original. or, traditionally, simply refer to the particular page(s) of the paper indicated in the PDF file, e.g. 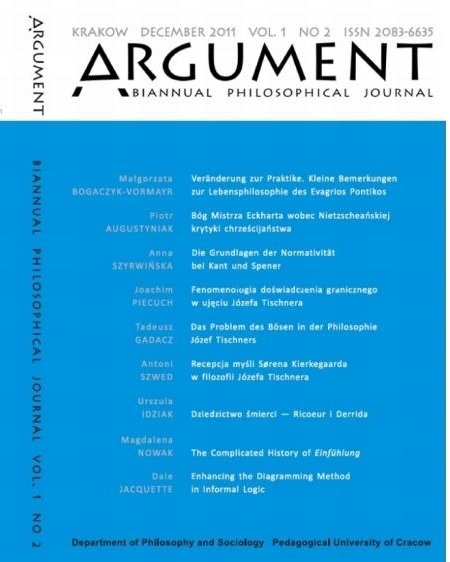 A. Smith, The Key Philosophical Question, Argument: Biannual Philosophical Journal, vol. 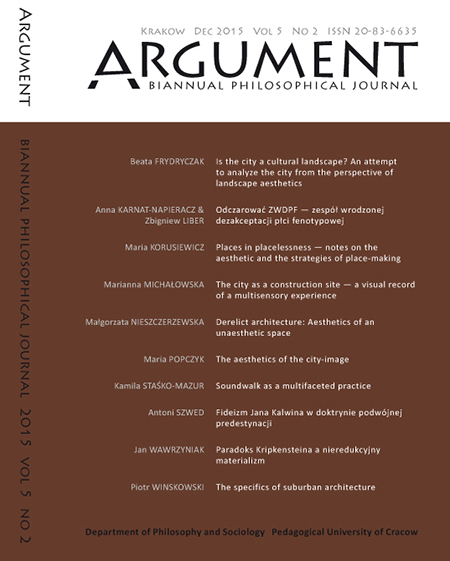 1, no 1 (2011), pp. 13-25. History. 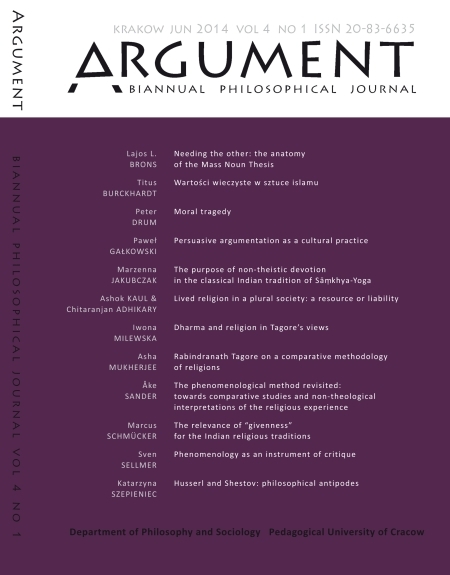 The Journal emerged in 2010 when the present Editorial Board and the Advisory Board have been established. 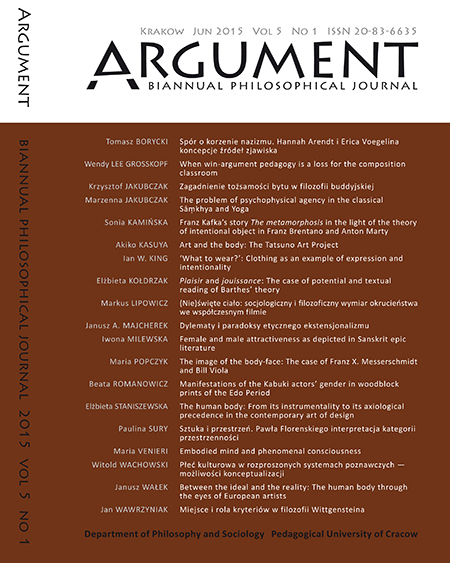 The first issue was published in June 2011. 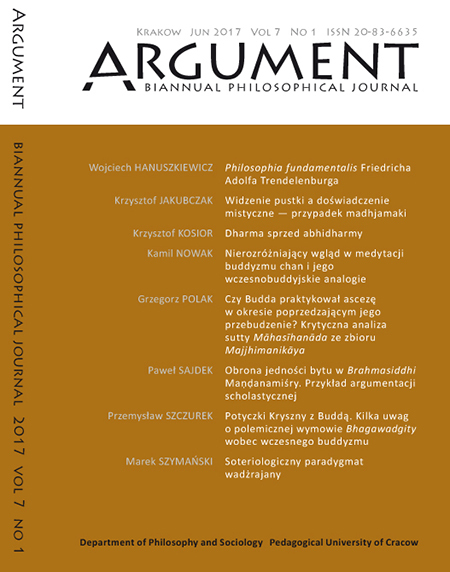 The Editors referred to the former philosophical journal Studia Philosophica, also published by the Department of Philosophy and Sociology, Pedagogical University of Cracow, within a series called Annales Universitatis Paedagogicae Cracoviensis. 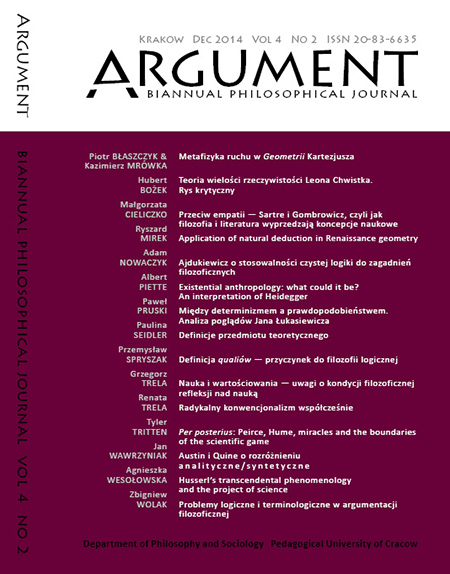 However, since 2010 the conception of the Journal has been essentially redefined and its structure reshaped. 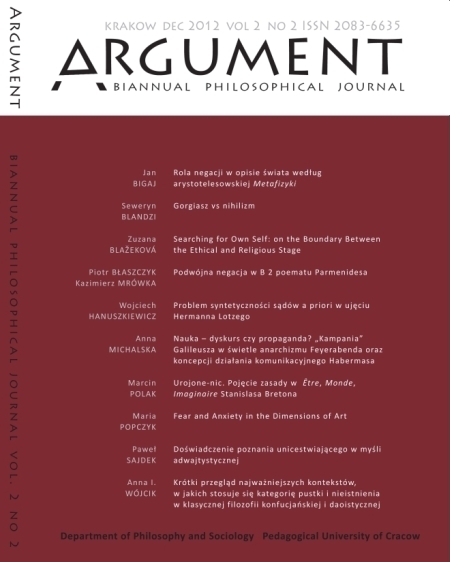 We decided to change the previous title to Argument: Biannual Philosophical Journal, while separating it from the University annual series and converting to a biannual peer reviewed online periodical.